The body and mind are a malleable technology! Is it possible to override these cyclic default programs? Is there a formula? Join me for this fascinating workshop! There are many human experiences that are perhaps no longer necessary but over time these experiences became normalized. We adapt and accept the perspective of reality we are born into. When nothing around us screams otherwise then acceptance seem to be the only way to go. But what if that’s not the case. It is evident that each day scientists, archeologists and historians claim to discover new interpretations of reality. We must begin to know that it is ok and within our right to bend reality to bend time and space. Reality wants to be shaped and molded into unlimited possibilities. The fear of reaching for what we believe to be the impossible drives us into an acceptance of the way things are. I continue to experiment with overriding these cyclic programs. It becomes increasingly clear to me that it is possible to do so. Let’s open up the conversation and unlock those possibilities from inside each of us. We will chat about the benefits of doing so. Life is not just about dying, sure nothing dies but there are locked away truths coded in our DNA! Come join us! What does resetting really mean? 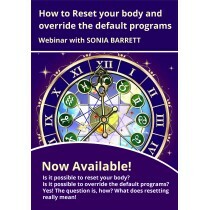 Note: There is a possibility that this webinar will be followed by a three part workshop to aid in navigating through the understanding of the resetting process. Understanding is key as you then own that possibility as a truth. Note: Only those who have participated in this webinar will qualify to attend. The reason being is that this webinar will have provided platform of understanding from which to launch. New information to operate from.